Thirteen trade unions have announced that they will not give their backing to Algeria's new Prime Minister, Noureddine Bedoui, who has pledged to form a government of technocrats including more women and young people. "We will not engage in discussions with the system, we belong to the people and the people refuse the system," declared teachers' trade union representative Boualem Amora. Thousands of Algerians have been protesting for over a month against the regime that has governed the country for nearly 20 years. 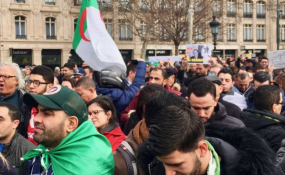 The protest was triggered by the decision by President Abdelaziz Bouteflika to stand for a fifth consecutive term, even though he is 82-years-old and has rarely been seen in public since he had a stroke in 2013. Last week, under mounting pressure, Bouteflika withdrew his candidacy and sacked his prime minister, replacing him with Noureddine Bedoui. However, Bouteflika did not stand down, instead postponing elections scheduled for April until an unspecified date. Demonstrators fear he is still trying to cling on to power and they are continuing their protests, demanding that he resign immediately. New prime minister Noureddine Bedoui's pledge to create a new government appears not to have convinced those taking part in weekly protests in the capital. Friday's demonstration was among the largest so far seen.